David Morton, professor of industrial engineering and management sciences, has been named chair of the Department of Industrial Engineering and Management Sciences (IEMS) at Northwestern University’s McCormick School of Engineering, effective September 1. Morton will succeed current chair Jorge Nocedal and assume the title of David A. and Karen Richards Sachs Chair of Industrial Engineering and Management Sciences. Nocedal, the current David A. and Karen Richards Sachs Chair of Industrial Engineering and Management Sciences, will continue to teach and lead research in optimization and machine learning as a Walter P. Murphy Professor of Industrial Engineering and Management Sciences. A member of Northwestern’s faculty since 2014, Morton directs Northwestern’s Center for Optimization and Statistical Learning. His work focuses on the area of stochastic optimization and its application to energy, security, and public health problems. 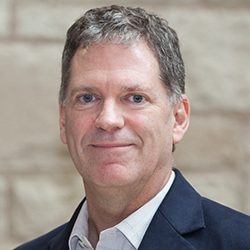 Optimization is often considered a team sport, so, as department chair, Morton plans to foster interdisciplinary research among the Department of Industrial Engineering and Management Sciences, the Department of Electrical Engineering and Computer Science, and the Feinberg School of Medicine. “I look forward to working with my colleagues and our students to grow the department’s interdisciplinary research collaborations and to develop innovations that provide our undergraduates with an exciting and rigorous education,” he said. Morton received his PhD in operations research from Stanford University in 1993. After serving as a postdoctoral fellow at the Naval Postgraduate School, he joined the University of Texas at Austin, where he became the Engineering Foundation Professor in the Cockrell School of Engineering. Morton has received multiple awards, including the Presidential Early Career Award for Scientists and Engineers, a Fulbright fellowship, and the Faculty Excellence Award from the University of Texas at Austin.